Oh. wow. Exceptional! I was choked up holding back the tears. The best volume in the series so far! Each chapter still focuses on one child and is episodic, yet like the other volumes there is a theme. This time we see the real suffering and desperation these foster kids from dysfunctional families are going through. The book starts off pretty sad and continues in that vein almost bringing me to tears then comes a story where it's the child who has the strength in her unique situation and for the final story something a little different as everyone gathers together while a typhoon rolls in. Exceptional writing and excellent illustration make this the most literary manga I've ever read. Highly recommended!! I love this series. The art and characters just give me the feels. I don't understand why I love this series specifically---maybe it's just looking in this 'different' life in Japan that makes me go through so many emotions. Matsumoto just has this charming slice-of-life brilliance that radiates off the page as each child struggles with a lack of familial bonds. I'll be with this series until the end. These kids can rage against a storm because it's tangible and loud and makes itself known, unlike the emotional and familial barriers that surround their personal tragedies. Ugh. This series is killing me. One thing I noticed was how amazing matsumoto is at portraying the beautiful chaos that is all children's lives, no matter their station. Out in the yard, at the dinner table, doing their chores, they're a mess of observations and accusations, exclamations and exasperations, here there and everywhere. And the adults are so rote and matter-of-fact in their responses to them, because like the storm that rages outside all you can do, especially with these children who are so full of anger and sorrow and longing, is to batten the hatches and hold on tight. The way these kids carry on despite hopes continually deferred is heartbreaking and inspiring. Affecting, humane, and quietly inventive stories about foster children in the Star Kids Home in Japan in the mid-1970s. Emotional without being sentimental and beautifully rendered in Matsumoto's striking illustrations. The storytelling quality has been extremely consistent through all the volumes - and if anything, it's only improved. I suspect the cumulative effect of these stories will be greater than the individual tales. Un volume con minore presenza di Haruo (anche se veniamo a conoscenza del momento del suo arrivo alla Hoshinoko). Rimane un ritmo spettacolare, una narrazione mai sopra le righe, mai didascalica. Davvero un fumetto poetico. 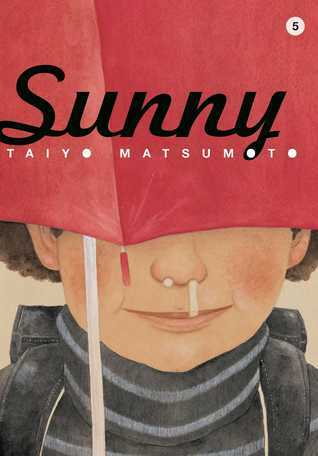 And for my 100th book of 2016, I read the 5th Sunny manga. Beautiful. Heartbreaking. Full of Love. Highly recommended. As a package, this book is beautiful: the brightly painted, off-white canvas covers, the green buffer pages, those occasional full colored splash pages before chapters. And as for the contents, Jesus its impressive to even think one man both draws and writes this masterpiece. I don't even know which talent of his I like more at this point. Hes writing heartbreakingly real characters that I never dreamed I could care about until he introduced them to me. Seriously nothing has choked me up while reading as much as a few of the panels in Sunny. But its also the way his characters are drawn that further grounds this real emotion. With simple pen work and water color washes, Matsumoto forces the reader to anticipate the feelings, both happy and sad, of these characters. Though their feelings are often quite sad.This is easily my favorite series in any medium, and feels like nothing else I've ever read or watched. It comes closest to feeling like something I have already experienced or lived and am truly grateful I was given a chance to relive. The plot might be dull for some, but if your invested, you'll only be left wanting more. Although readers would do well to read the previous volumes before tackling this one, they will quickly be drawn into the world of several troubled children in Japan. Each chapter focuses on one youngster, allowing readers to explore the hopes, fears, anxieties, and disappointments of those children. As a typhoon heads for the area, the children and their adult caregivers batten down the hatches as they prepare for a bumpy ride. The weather may be threatening and unlike any weather they've ever experienced before, but these are children who have already endured the storms of life through losses, cruelty, and illness. I hope they'll survive this one just as they've weathered the others. This is an engaging, fascinating series from Japan, and it is one well worth the time it takes to read it. This is the first volume of the series where I detected a noticeable theme running through the individual chapters. 'Escape' has always been on a concept within the series (escape from the Star Kids Home, escape from one's circumstances or life situation), but in this volume that slow-burn build up finally materializes in concrete ways. Haruo's desire to live at a 'better' foster home, Sei's plans to travel and reunite his parents, Megumu's fear of leaving the home, Jun's cold-induced flights of fancy: each is an individual expression of that desire for escape, or more importantly coming to terms with it. It's only fitting then that the volume ends with Makio, a twenty-something former resident of the home, returning to pay a visit.Exceptional as always. The next, and last, volume will be bittersweet. Volume six doesn't actually come out until next month (November), so prior to delving into this one, I preordered volume six and threw volume one in there as well for free shipping. I can't tell you guys how much this series means to me. I've cried (in a good way) at every volume. The writing is great but the art is truly something to behold. At work we only have volume one, but it was enough to get me to order the others through interlibrary loan. Highly, highly recommended. P.S. I may petition to move volume one to YA so it actually circulates. We'll see. I am consistently impressed by the emotional honesty of this series and its ability to portray the conflicting emotions of its child protagonists with the weight and seriousness that they deserve. This is about children, but it is not a children's book - rather, it is a series for people who once were children and remember that it wasn't the idyllic picture painted by the nostalgic media. Matsumoto's skill only grew along these five volumes: each chapter now feels like a whole story, and all left me with a sense of awe, for pain, for struggle, for the ephemeral thing that is connection. I'm looking forward to the publication of Volume 6. Old characters reappear, new stories emerge. Nothing necessarily progresses, but this is the ultimate slice of life. It doesn't need to go anywhere in particular when so much subtlely unfolds along the way. i love the drawing in Sunny so hard that i can't say anything intelligent about it or the stories--which deserve intelligent discussion. This whole series was simply magical. The story, the art and the fully-realized character came together to make one of the most enjoyable, provocative and...pleasant reading experiences I've had. Taiyo Matsumoto - Although Taiyo Matsumoto (松本大洋) desired a career as a professional soccerplayer at first, he eventually chose an artistic profession. He gained his first success through the Comic Open contest, held by the magazine Comic Morning, which allowed him to make his professional debut. He started out with 'Straight', a comic about basketball players. Sports remain his main influence in his next comic, 'Zéro', a story about a boxer.In 1993 Matsumoto started the 'Tekkonkinkurito' trilogy in Big Spirits magazine, which was even adapted to a theatre play. He continued his comics exploits with several short stories for the Comic Aré magazine, which are collected in the book 'Nihon no Kyodai'. Again for Big Spirits, Taiyo Matsumoto started the series 'Ping Pong' in 1996. 'Number Five' followed in 2001, published by Shogakukan.Source: Lambiek website bio .